Amongst the excitement of starting uni and the beginning of freshers week, you’ll probably be preoccupied with making friends, navigating around your new home and getting involved with the many activities (and well, partying) on campus and around the city. 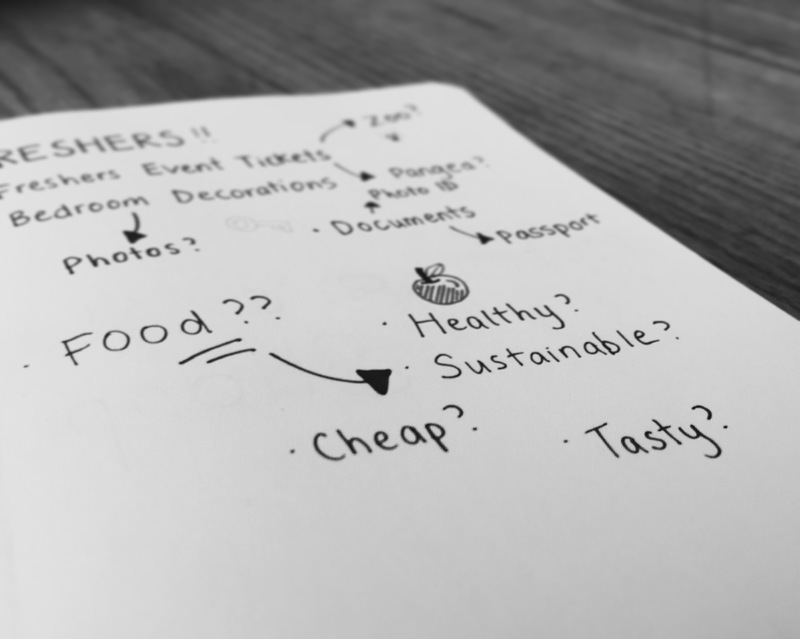 With so many things to remember, where does food come on your list of priorities? Or more importantly, where does eating healthily appear? 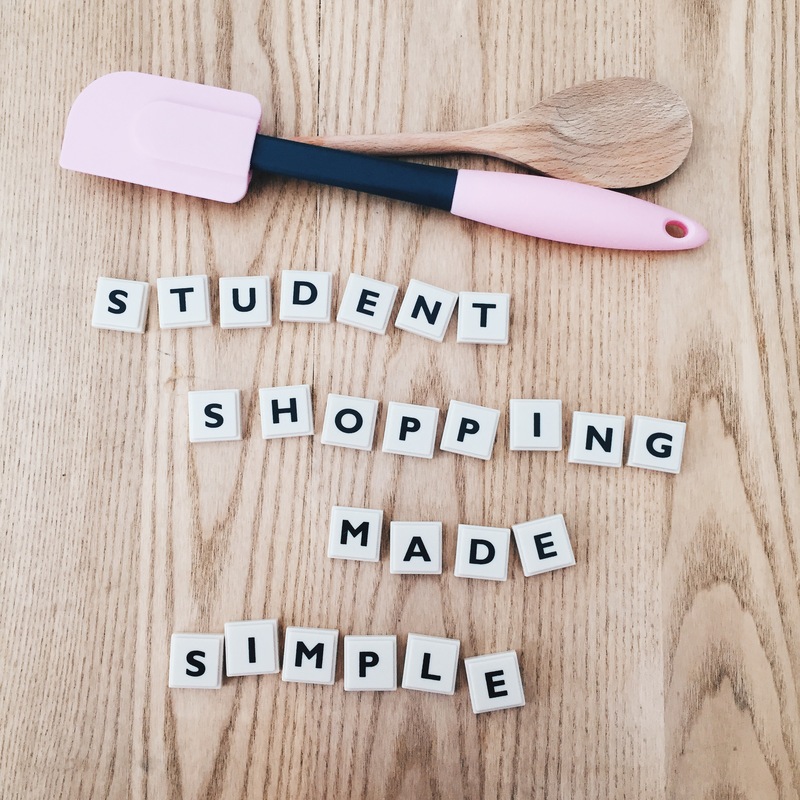 Eating well is key in being a successful student. Food is fuel. If you put good things in, you will get good things out, and your uni experience will be fulfilled to its full potential. But where do you start? How’s the best way to shop in order to get the most for your money? What do you put with what? Well no fear, here is a list of essential food items and tips on how to master the freshers food shop. First of all, make a list of what you want to buy, where you’re going to go and your budget. This is SO important, and takes just a few minutes. There’s a few extra things what can make your first food shop a lot easier. • Sharing is caring. If you’re able to, make a friend and shop together. Bigger packs are often a lot cheaper, so splitting the food and splitting the price is a great way to save even more money. • Avoid branded bargains – BOGOF deals may tempt you in, but think, do I really need that much food? Is there a cheaper, unbranded alternative? Sometimes buying two of a product may look cheaper, but if you’re ultimately going to waste the extra item, it costs you more. Think carefully, waste less, save more. • Shop in the evening – large supermarkets in the evening are host to the student dream: the reduced fridge. If you want to grab a pizza for 50p or a bunch of bananas for a couple of pennies, this is a great time to buy your food. If it has a fast approaching sell by date, simply freeze until needed! • Remember your bags for life! Not only are you helping the environment and promoting sustainability, carrier bags in the shop cost. The cost of buying bags will soon mount up (and be a prime source of mess in your new student pad), so avoid it when possible. Dried products, especially those that are whole grain, are student staples. Not only extremely cheap to buy, they are easy to store and even easier to cook. Grains are packed with fibre, B vitamins and iron, to contribute to optimum energy levels and a feeling of fullness throughout the day. A bowl of porridge (oats and milk) or a homemade Chinese (noodles + grilled veg and sauce) are simple energy boosting meal ideas. The secret to enhancing the flavour of your home cooking is seasoning well. Ditch the salt and opt for healthier, tongue tingling options that are packed with essential oils, antioxidants and phytonutrients, as well as flavour. If you like spice, add chilli powder to your dishes for a kick or to enhance your pasta sauces, add a spoon of mixed herbs. Simple to store and with a shelf life with up to 25 years (!! ), tinned and jarred foods are a great way of packing nutrients into your diet without having to worry about sell by dates. Chopped tomatoes, full of vitamin C and K, can be simmered for ten minutes with a few herbs to create your healthiest, cheapest pasta sauce possible or why not blend some chickpeas to make your own houmous, a high protein and fibre snack alongside some crunchy carrot sticks and pitta. You might have already done most of your growing, but your late teens are a key time in defining your bone health and density, which is not only defined by keeping active, but by protein and calcium in the diet. Adding yogurt to a homemade curry will give it that creamy edge or topping your toasted granary bread with scrambled egg will give you those extra nutrients for the day. Getting in your five a day as a student is more important than ever. With a busy lifestyle, meeting new people and a few of those, erm, hangovers, your immune system needs to be fighting fit from all those vitamins and minerals. The easiest way to get fruit and veggies into your diet is incorporating them into meals – why not make your own chunky tomato salsa to accompany a baked burrito, or freeze some grapes and add them to a yogurt and honey pot? Previously the home to those low nutrition, fatty ready meals, the freezer has gone back to its roots as the top way to preserve fresh foods that you probably can’t finish by its sell by date. Mixed veggies packs are amazing for adding nutrients to any meal throughout the week, whilst still containing maximum vitamin levels. Getting your essential fats, protein and minerals from meat is also home in the freezer. Buy simple plain strips of chicken or pop in some singular steaks and use when you need. Top picks: Morrisons’ Chicken Strips – £2.24 for 400g, ASDA’s Stir Fry Vegetable Mix – £1 for 500g.